Have you ever dressed like a box of crayons? I have. This past weekend. To go eat German food. Makes sense, right? Actually, I blame my outfit on blogging. If it weren't for being inspired by all the other bloggers out there I would definitely just have worn blue jeans with this top. So thanks, guys. Also, this is quite off topic, but Eric and I are traveling to Europe this summer (Paris, London, Dublin) and I would love any advice! Any travel tips, must-sees, must-eats, etc. Lay it on me! Ash when you are in Paris go to the Rodan museum. I hated Paris, but this one museum redeemed the whole city for me. Enjoy! Loving the box of crayons look! 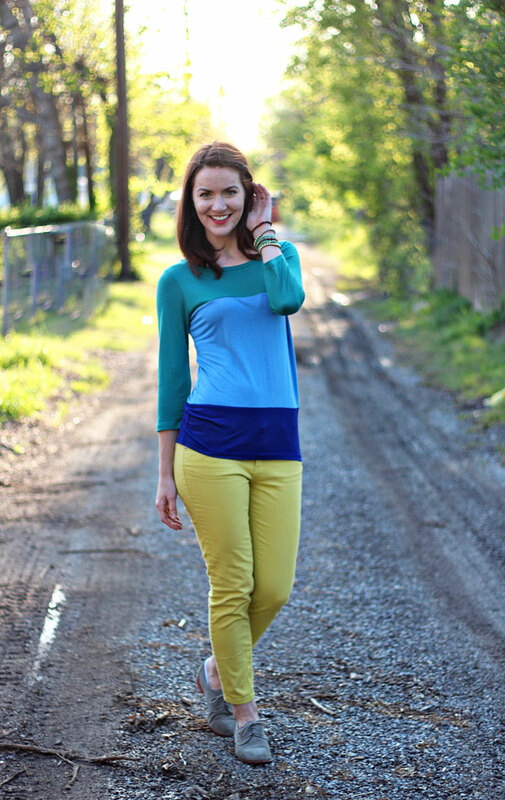 You color blocked fabulously! also I've never had German food... crazy I know. You definitely need to try it! I can't say I'm a huge fan - it's pretty "meat and potatoes," but it's definitely good to try! That is so awesome, Annie! Can't wait to read about it! Love the color blocking! I am definitely more adventurous with my wardrobe mixing colors and patterns because of the fashion blogs I follow! You'll love London! I had a great time last year! I'm oober jealous of your trip to Paris and Dublin since I haven't been yet! Definitely do all the must haves in London - London Eye, Parliament, Buckingham Palace! wow! trip to europe thats so exciting! im jealous! hope you have the best time! I would highly recommend spending some time at the Tower of London! It is so interesting to wander around, and they have guided tours which are really neat! Love the yellow and blue colour combo! I would recommend catching a musical whilst your in London. So fun! I love the color blocking! Loving this look! So casual yet totally put together at the same time! I love dressing like a box of crayons!! Your outfit is so cute! Definitely go to the orangerie, best museum in paris! Yes! I love dressing like a box of crayons. =) I love this look! 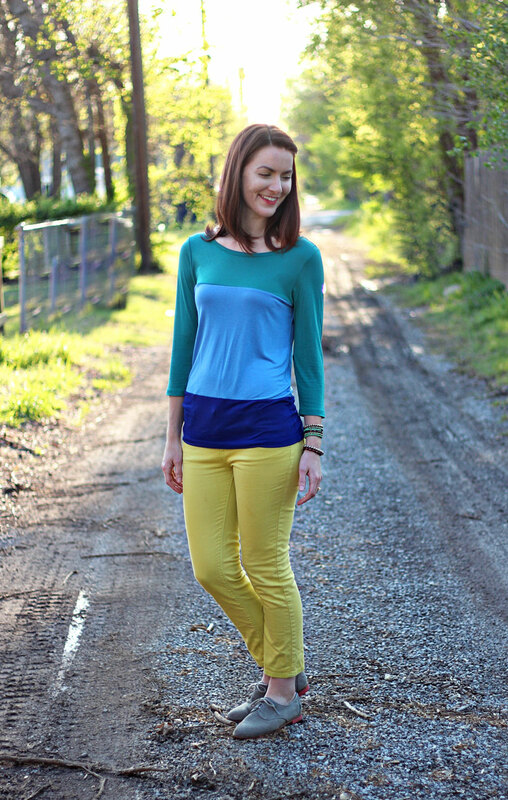 The yellow pants are super fun and I love your cute oxfords! Sometimes we all just need to embrace the crayons :D I haven't had the pleasure of travelling to Europe yet but I hope you have a blast (and blog all about it). Looking forward to reading about your adventures. Nothing wrong with adding a little (or a lot) of color!! It brightens up your face...you look great!! Found you through Wardrobe Wednesdays -- I LOVE all the colors you have here! Super cute. Love the color blocking! Super cute outfit! Love love love the yellow jeans! They are the perfect shade! Oh gosh.. I LOVE THIS OUTFIT!!!!!!!!!!!!!!!! Head over heels, in love! As for travel recommendations, I'll ask my aunt! She lives in Paris! ;) Lucky, I know! I went once... To Paris and London. But it was almost ten years ago and my memory is fuzzy. Obviously, going to London, you have to go to at least ONE pub. I know it sounds basic, but from what I remember, it was the best tomato soup ever. As for crepes... And chocolates in Paris. That's a gimmie. And the Louvre is worth the trip! I'm not a huge artist junkie, but it is so breath taking! 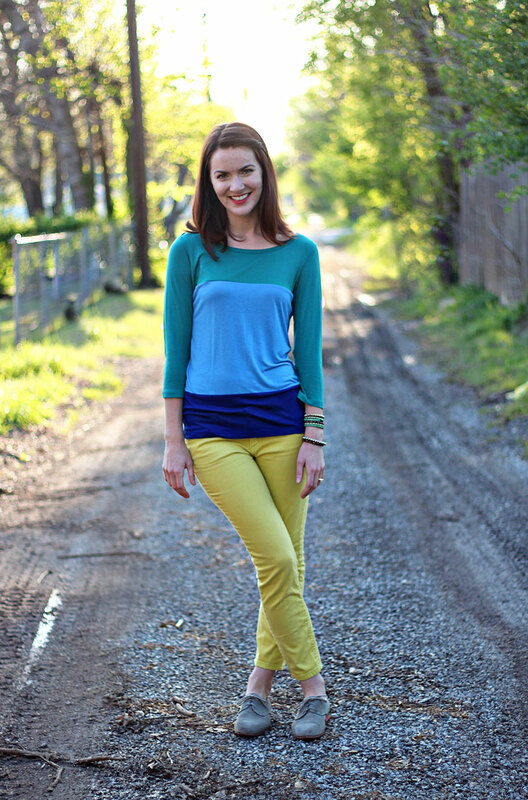 This color blocked top is adorable on you. I love that you paired it with bright pants as well! I like the way you think out of the crayon box :-) Long live blogging and all those lovely inspiring people out there! Awwww I think you look cute! How was the German food?! I'm actually not a huge fan of German food in general, but this was some of the best I've had! Paris: Angelina's (http://www.angelina-paris.fr/en/) - it's very close to the Louve and it has the.best.hot.chocolate! The recommendation is via Ashley Ford's sister. It's a little pricey, but you get a lot for what you pay. We also loved the Musee d'Orsay, walking around Notre Dame area and Sainte-Chapelle. Really you can't go wrong with the top sights. Worth stopping at a crepe stand (or 2 or 3) as well. London: London is just so wonderful. It's worth visiting Westminster Abbey, the Tower of London (although it's kind of expensive, but still worth a look), the British Museum, Hyde Park (you can rent bikes at different places in the park and drop them off at other bike stands for just a pound or so), and the British Library (there is a room on the first floor that has tons of manuscripts - everything from Jane Austen to the Beatles to the Lindisfarne Gospels). Soho is a great area to find something to eat. Oxford street is nice for shopping, but they are mostly chain stores and it's very busy. You can easily walk between Big Ben, Trafalgar's Square & Buckingham Palace. When you get there I would recommend getting an Oyster card to take the tube otherwise getting single tickets is really expensive. Even just walking around is really nice. Dublin: We didn't stay long in Dublin but we really liked the Guinness Storehouse and walking around the parks. Sorry, that's probably too much :) Hope you have a great time! When are you going to be in London? 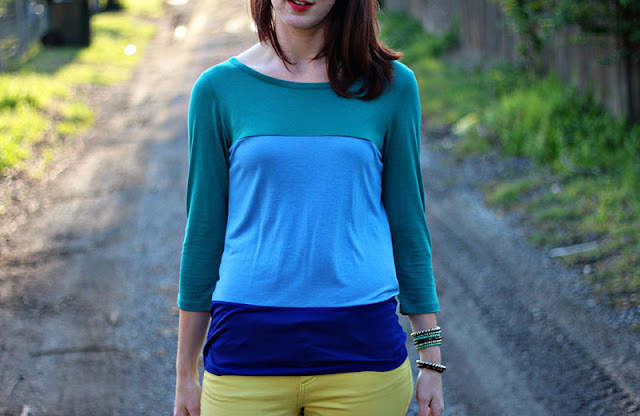 love the cute color block top! way cute! you wear it so well!